Hey friends! I’m back showing my range of lip products that I love to use focusing on the pinks and reds for this week. 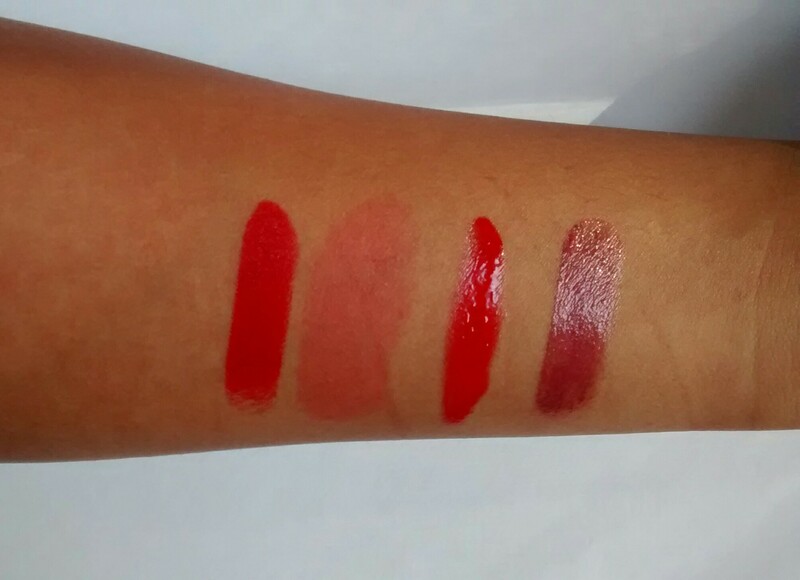 Kajal has also shown her favourite reds too which I definitely recommend you checking out here! From Left to Right in artificial light: Rimmel Kate Moss Collection 01, Benefit’s Benetint, Maxfactor’s Captivating Ruby & No.7 in Sassy. 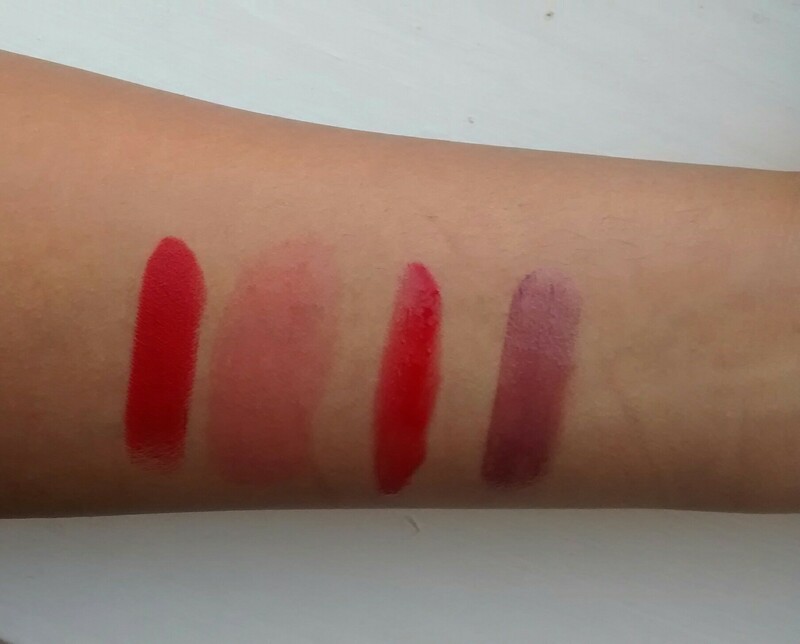 From Left to Right in natural light: Rimmel Kate Moss Collection 01, Benefit’s Benetint, Maxfactor’s Captivating Ruby & No.7 in Sassy. If you’re looking for a red which can make you feel ultra glam on a night out or sassy during the day I love using the Kate Moss range by Rimmel in the colour 01. 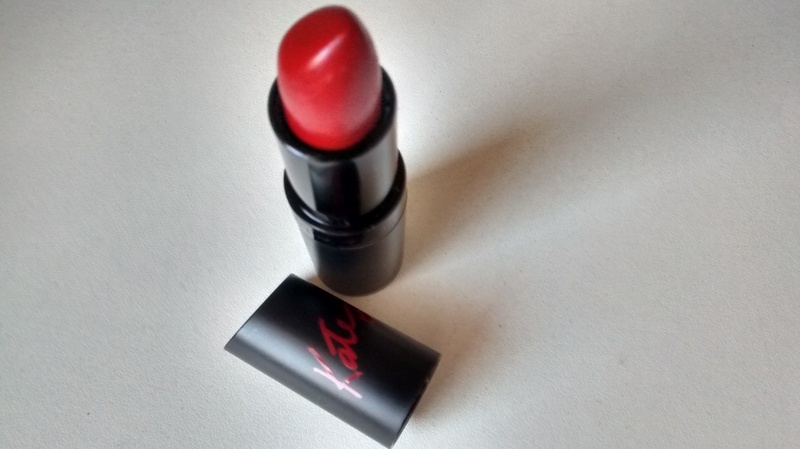 This gives the most rich, vibrant red colour that I think everyone wants from a red lipstick. It also has that blue undertone which makes your teeth look even whiter which is always a bonus. I bought this as a replacement for MAC Ruby Woo and in comparison the Rimmel lipstick is much more moisturising, smells better (kinda like sweets) and most of all SO MUCH cheaper! You can see me use the lipstick in my classic eye look here. If you want a lipstain which lasts for a good number of hours I recommend Benefit’s Benetint. It is a sweet red colour that isn’t overpowering and is great for an everyday look. An added benefit (no pun intended 😉 ) is that it can be used on the cheeks as bush. For us darker skinnned girls you do need to apply a fair few layers to get a really red colour so do remember that if you wish to purchase Benetint. 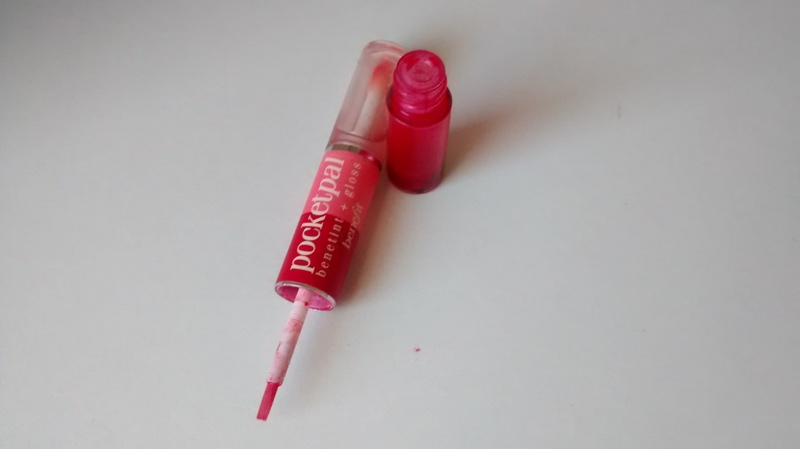 I own it in the PocketPal form which has an added gloss but I tend to just use the tint on its own as the gloss is a bit too sticky for my liking. I’m not that much of a fan of lipglosses so to actually like on is quite a big deal! 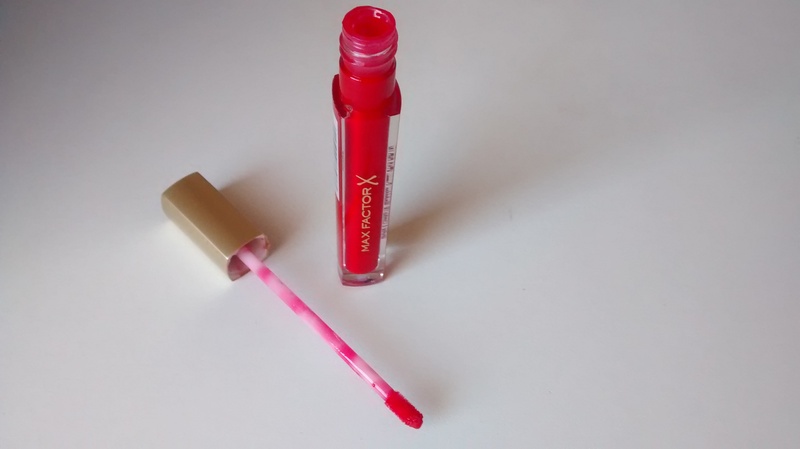 I got this Max Factor Colour Exilir Lipgloss in the colour Captivating Ruby (30) as a freebie and assumed it would have that sticky feeling that I described before. But, surprisingly it applies really smoothly and not leaving that tacky residue we all dislike. 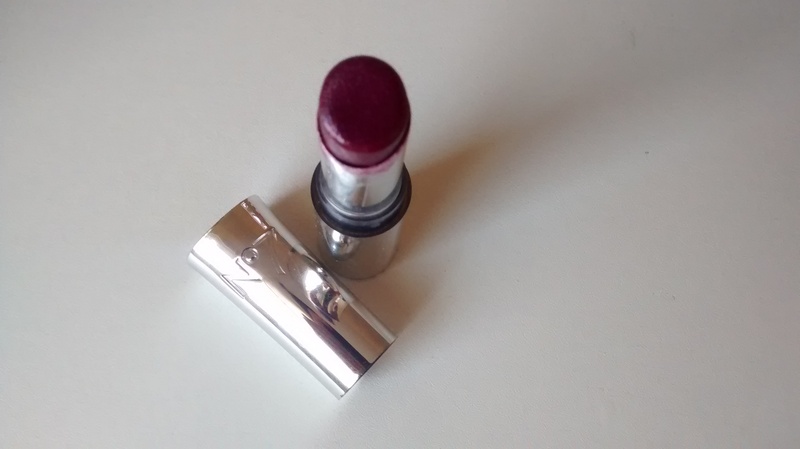 Most of all the colour is really opaque which again is unusual for a gloss. If I decided not to wear my Rimmel lipstick this gloss is definitely my go-to red. Max Factor Colour Elixir Lipgloss in Captivating Ruby (30). Recently, I’ve been trying to gain more confidence in wearing stronger and deeper colours like purples as I know they look really good in the Autumn and Winter months. I decided to start of pretty tame with No7 Sheer Temptation in the colour Sassy. It is pretty sheer, as the name states, but because of the deep colour there is still a good colour payoff. I would pair this with a simple eye look to ensure that my lips are the focus on my entire make up look. No7 Sheer Temptation in Sassy. I hope you enjoyed this little insight into my red lipstick collection, I’ll be back in a couple weeks showing you my nudes. Lipsticks I mean. Hehe. Till next time, Bye!